As well, Canada’s Kevin Koe has clinched a playoff berth, thanks to the results of Friday afternoon’s draw at the ENMAX Centre. 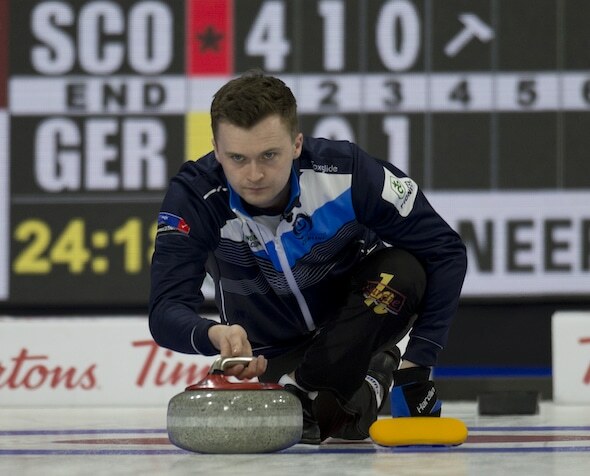 After a 1-3 start, Scotland’s Mouat, third Grant Hardie, second Bobby Lammie, lead Hammy McMillan Jr., alternate Ross Whyte and coach Alan Hannah, have gone 6-1, with their latest win Friday afternoon, 9-2 over Marc Muskatewitz of Germany (4-8). That left the Scots at 7-4 and in a position where if they beat Joel Retornaz of Italy in tonight’s final draw, they finish in sixth place and snag the sixth and final playoff berth. Lose and they’re out, and the Italians get the final berth — a situation Mouat doesn’t mind, at this point. “Yeah, it’s always nice to have it in your own hands and not have to worry about any other results,” he said after his team scored four in the first end against Germany and added three more in the fourth to cruise to the needed win. Defending champion Niklas Edin of Sweden (11-1), already having nailed won top spot in the round-robin and a bye into Saturday’s semifinals, scored deuces in the fifth and ninth ends for a 7-4 win over Italy (7-4). Jaap van Dorp of the Netherlands (4-7) had three deuces but needed a single in the tenth for an 8-7 win over Magnus Ramsfjell of Norway (2-9) and Yuta Matsumura of Japan (9-3) scored three in the fourth for a 7-5 win over Sergey Glukhov of Russia (4-8). The results left Canada, Peter de Cruz of Switzerland (8-3) and Japan fighting to determine who will get second place and the other semifinal berth. 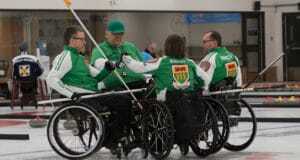 Canada plays the Netherlands and Switzerland takes on Qiang Zou of China (2-9) in the final draw. John Shuster’s U.S. team (7-4) also has clinched a playoff berth. Teams finishing in third through sixth will play qualifying games Saturday morning at 9 a.m. to determine which two teams move on to the semifinals. 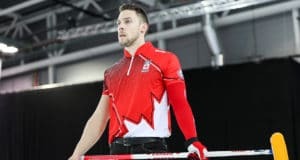 The 2019 Pioneer Hi-Bred World Men’s Curling Championship continues with the final round-robin draws tonight at 7 p.m. MT.